I am totally new in midi, so please forgive me when I ask an strange question. First I imported a midi files into the Motif XS. Next I muted some channels. The I changed the voice of the channels I want to hear and saved the song. When the midi file is played, the voices change again. How do I make sure the voice on a channel keeps the voice I selected? 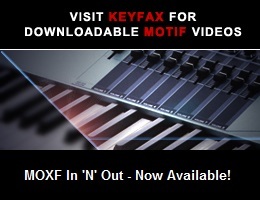 First I imported a midi files into the Motif XS. I presume you mean that you loaded a .MID file to an XS Song location. If not, please tell us. Next I muted some channels. The term “mute” is often misused - it has a particular meaning with reference to the XS. An XS Part/Voice or Track can be “muted”. Exactly what did you do? The I changed the voice of the channels I want to hear and saved the song. You apparently changed the Voices related to certain Parts, which are assigned to certain Tracks, and then saved the edited Song. When the midi file is played, the voices change again. I presume you mean that when you played the previously edited and saved Song, the Voices reverted to what they were before you changed them. I presume you are referring to the Voice for a Part. If the change you made isn’t remaining after it was stored, then the file you loaded might be a General MIDI (GM) one. In that case there can be a GM Reset message at the beginning of the file. That will cause the Voices to revert. To prevent that, the GM Reset has to be removed from the sequence. I hope that helps. Please ask further questions and/or supply additional information as needed. Thanks, thats was the answer I needed. I edited the song and stores it into the Motif XS. When I power off and on again the song is lost. How is this possible. I looked into the manual but still the song is not stored. Thanks again! If you don’t know those things, you can search for a long time. I have a final question. On channel 16 in the song I made a click for the person on the drums. Output for channel 16 is asL. When the song is played you can hear the click still on the normal outputs. On the assL output you can hear the click also, but also the other channels of the song. When assR is selected for channel 16, things go correct. No problem - I’m glad to help. Your XS likely has leaky output muting transistors on the affected channels (assignable L, Main R and L). I’ve written about the problem numerous times.